Endometrial biopsies and ultrasonography are important diagnostic procedures in assessing gynaecological disorders. Diseases of the female reproductive system which can often affect fertility can be diagnosed with the use of these tests. 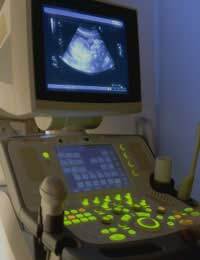 The ultrasound for example is especially useful in assessing the structure of the ovaries. The ovaries are vital of ovulation. Without ovaries ovulation is impossible. Without ovulation natural fertilization is impossible. The endometrial biopsy has a reserved role in fertility assessments. It is indicated when diseases of the endometrium are implicated in the cause of the infertility. For example endometriosis is a special condition which affects the lining of the uterus. This abnormality can affect fertility as well. When this condition as well as others are suspected an endometrial biopsy may be preformed, to confirm the diagnosis. Other indications for endometrial biopsy include endometritis, internal fibroids, and endometrial cancer. The ultrasound has come along way since the black and white hazy, snow images of the past. With the advent of Doppler ultrasound these images are enhanced using color gradients. With improved contrast and image clarity, the diagnosis can be more accurate and reliable. The Ultrasound can be used to evaluate disease in both men and women. In men conditions such as cryptorchism, varicocele, testicular torsion, and testicular trauma can be evaluated using ultrasound technology. Cryptorchism is the medical term for testis which fails to descend into the scrotum. This is commonly diagnosed in the early years of childhood. During male reproductive development the testes originate within the lower abdomen, and migrate slowly down towards the scrotum. When this process fails to occur the scrotal sac remains empty. In some cases the testis will eventually migrate down as the child grows older, but when that doesn’t happen, an ultrasound can be used to locate it within the body. The ultrasound image provides the surgeon with a roadmap on where and how to proceed. Varicocele is a common cause of male infertility, and it can easily be diagnosed with the aid of the ultrasound. This is a disease of the veins within the groin; the disruption in proper venous flow can impact the testis and thus affect fertility. Testicular torsion is a serious condition often requiring emergency surgery, again the ultrasound can prove to be a valuable resource due to its quick availability, and ease of use. In females the ultrasound is even more valuable; it can be used to evaluate the ovaries, the uterus and even the fallopian tubes. Sometimes a pregnancy occurs in the fallopian tubes, an abnormal site of implantation. This can be life threatening to the mother if it is not properly diagnosed and treated in time. Other conditions where an ultrasound would be helpful include; polycystic ovarian disease, ovarian cancer, and fibroids. The endometrial biopsy is not as versatile as the ultrasound but it is more intricate, and specialised. The endometrial biopsy is helpful in assessing the structural cells of the uterine lining. It can provide information about the stage of the endometrial lining in comparison to the menstrual stage. If the endometrium isn’t responding to female reproductive hormones, then there will be irregularities in the menstrual flow. A biopsy can help identify such abnormalities. Endometriosis is a condition where endometrial tissue finds its way in abnormal locations such as the ovaries, fallopian tubes, and sometimes even the abdomen! To confirm this diagnosis, a pathological report is sent using samples of such tissues. Advances in medicine have led to improved diagnostic tests and procedures. These improvements have added to patient care by confirming diagnoses quicker, and subsequently starting treatment earlier, ultimately leading to improved outcomes. The use of the ultrasound and the endometrial biopsy, are leading examples of such improvement in healthcare, especially in the area of infertility.